Made in Cirebon, Indonesia, 2001. Bin House is a batik design house established by Josephine Komara and Yusman Siswandi, first in Jakarta in about 1978 and more recently with shops, offices and exhibition spaces in Indonesia, Singapore, particularly Japan and also the Netherlands. Using traditional design and a cottage-industry approach, it caters to an exclusive and lucrative domestic and tourist market, particularly Japanese customers. It aims to use traditional designs and reinvigorate them. 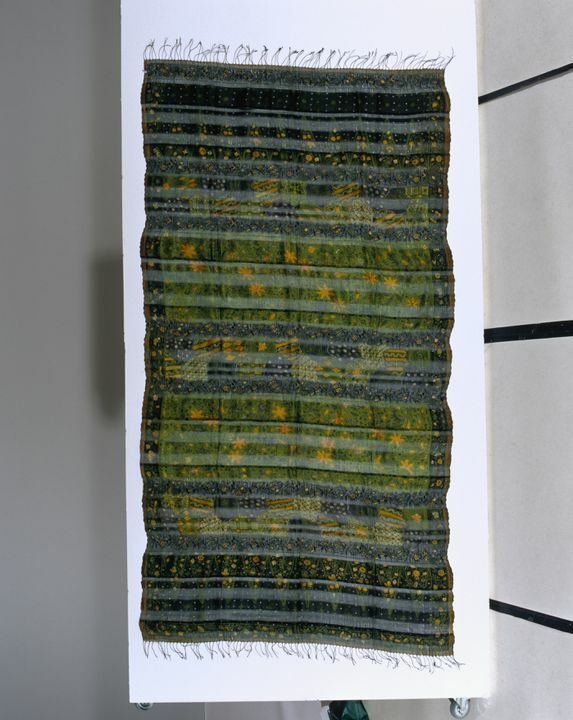 Shawl, selendang (shoulder cloth), handwoven silk with alternate weave and embroidery, batik, Bin House, Java (possibly Cirebon), Indonesia, 2001. This selendang or shawl is of silk gauze with width bands. It is of batik, with some supplementary wefts and embroidery. It has a black tied fringe and the edges are scalloped. It may be machine-embroidered. It is predominantly green with yellow, indigo and white. It has a floral pattern and a patchwork pattern in the middle. This was possibly made in a workshop in Cirebon, a coastal town of Java.